When you are in a multi-line display, it is possible to sort the grid by double clicking on the column heading. Care: Some columns are enabled for daisychaining to another display screen. A single click may daisychain to another display screen for the field of the selected record. An example of a multi-line display is the DF11003 format. 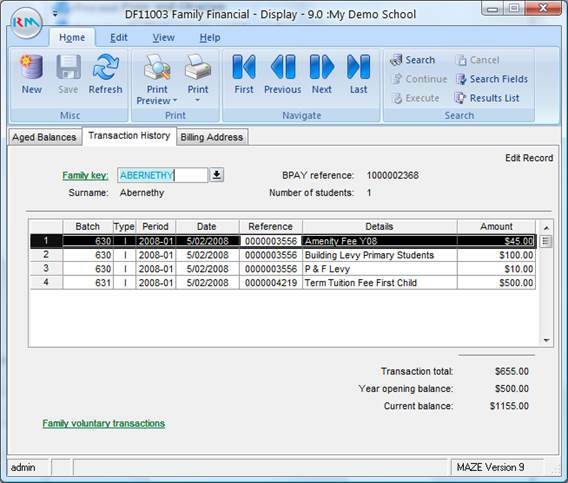 If you wanted to sort the transactions by amount, for example, you could double-click on the column header ‘Amount’. If you wanted to sort the transactions by the type of transaction, you could double-click on the column header ‘Type’. This ‘sort’ feature is also available in lists. For example, if you opened up a drop down list of Students, you can order the list by other fields, apart from their Key.